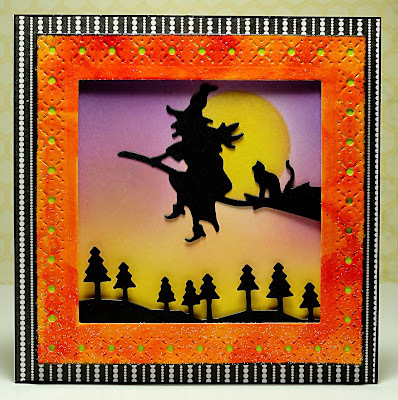 Halloween is just around the corner and I have a fun silhouette design to share with you! This card was created with 3 different die cut designs: Penny Black's Snowflake Stitch Frame, Witches Duo and Trees and Hills. Let's start with the portion of the design inside the frame. A white cardstock square was inked with Thatched Straw VersaMagic, Dandelion Mention Luxe, Spring Pansy VersaMagic, and Concord Grape VersaMagic to create a night-time scene. The positive and negative portions of a die cut circle aided in creating the moon and sky around the moon. This was then set aside as the other elements were prepared. The interior elements of the trees and flying witch were die cut from black cardstock. For the frame, the Stitched Snowflake Frame was die cut from orange cardstock and splashed with red Grumbacher watercolor and dried with a heat tool. Then the frame was pounced with Watermark VersaMark ink, sprinkled with sparkle embossing powder and heat set. The finished piece was backed with lime green cardstock to reveal a bit of contrasting color through the frame holes. All the components were then layered with 3M Scotch Foam Mounting Tape as shown in the picture and attached to a card base covered with Coco Style Designer Paper. 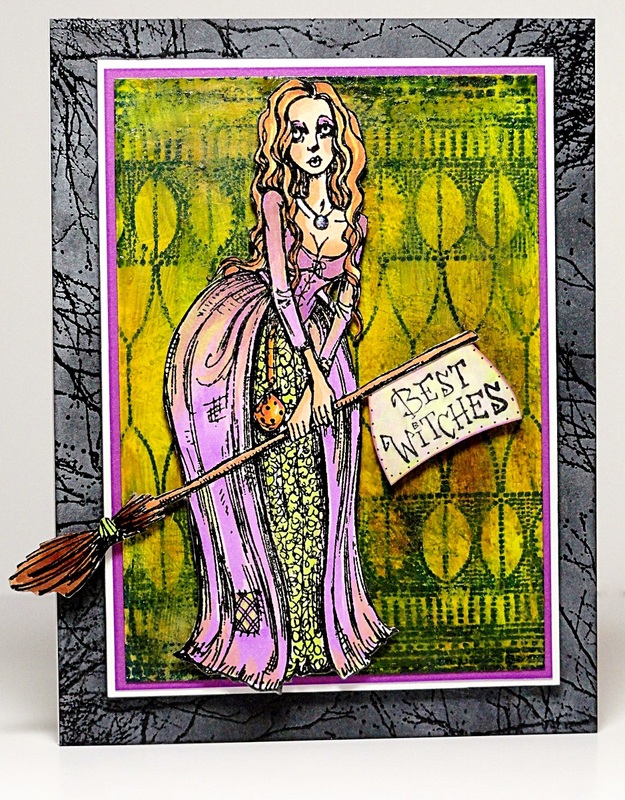 "Witching" you a spook-tacular Halloween! 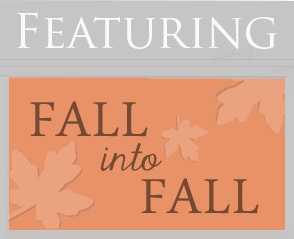 I'm popping in today with a quick post and a fun little tag design. I can't wait to see what Elizabeth will be sharing next... stay tuned! Halloween designs are a brewin' on my art table. For me, this design was all about the journey. My approach for this card was to play with different mediums, colors and layers without having a specific card layout in mind. When it comes to Halloween, I tend to shift from clean and simple white space to full on color. To begin, I stamped "Witchy" on white cardstock with Onyx Black VersaFine ink and heat embossed it with clear embossing powder. I colored the image with Copic markers and fussy cut the image. 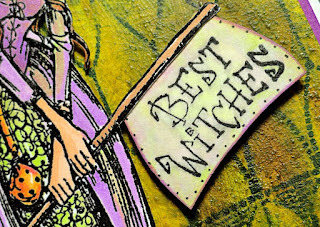 I knew I wanted some sort of sentiment, but not as a separate stand alone element so I incorporated my greeting into her broomstick. 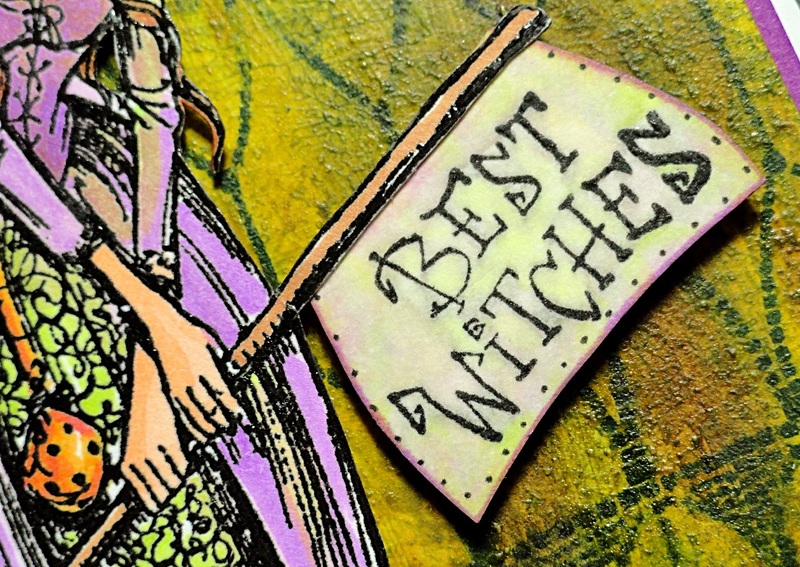 The sentiment from "Best Witches" was stamped on white cardstock and cut by hand into a shape that would work with the handle of the broom. I wasn't too particular on the coloring. I used the same colors I used in her dress, but mottled the colors when applying them. The background is where most of my journey occurred. Other than knowing what color tones I wanted, I had no expectations of how I wanted the finished piece to turn out. With that being said, I grabbed a rectangular piece of white cardstock and started covering it with clear gesso. To quicken the process, I dried the gesso with my heat gun. Then I started splashing Grumbacher watercolors all over the piece. It was fun not worrying about being precise or the fear of muddy colors. I just went for it. There was a certain point that the colors "spoke" to me and I knew it was time for a background pattern. After seeing how the colors turned out, I knew the perfect backdrop would be "Parade of Squares" which was stamped in Midnight Blue StazOn. I loved the effect. Almost like she was standing in front of a wrought iron gate. One final layer of matte gel medium sealed the colors and allowed me to distort some of the stamping. To finish the card base, I figured if she was standing in front of a gate then there should be some trees in the distance. 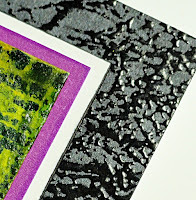 Black cardstock stamped with Peaceful Moment in Onyx Black VersaFine and heat embossed with clear powder gave that effect. To make it even more mystical and to add a touch of fog, I randomly rubbed Wedding Dress Memento Luxe ink over the embossing. The layering is pretty straightforward and you will be able to tell from the picture how I matted the pieces. There is 3M Scotch Foam Mounting Tape beneath the witch and the white cardstock mat. Oh, and for her magical locket a tiny spot of Crystal Stickles. 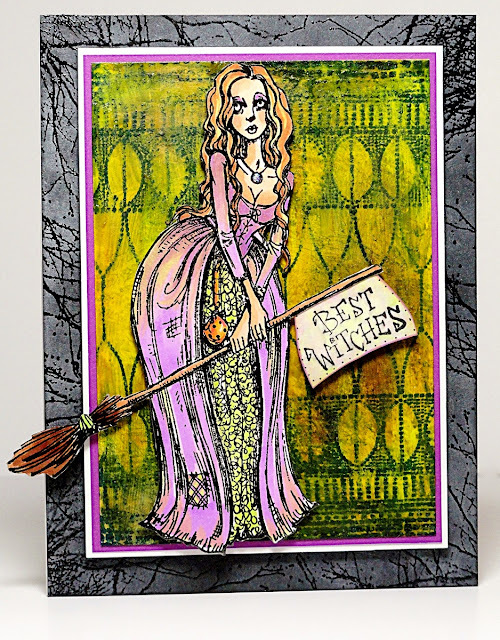 Stayed tuned to find out if Jill's next design is filled with fall foliage or Halloween magic. I had such fun creating this spooky scene using Penny Black Creative Dies. All of my die cut pieces were painted with Distress Ink Reinkers used as watercolors and then, once dry, Distress Ink was added using an ink blending tool and foam pads to give the pieces extra dimension. The hand trimmed hills and the moon were cut from white paper and inked with ink blending tools and foam pads. The sky was first painted with Distress Ink Reinkers used as watercolors. Once dry I added a heavy layer of inks on top using an ink blending tool and a foam pads. I wanted a smooth look and this helped even out the brushstrokes left from my painting.